The 4-H pledge was first adopted in 1927 in Washington DC. While all the “H’s” have significance for youth, health is the key word here. UMASH, Minnesota 4-H, and the Minnesota Department of Health (MDH) joined together to produce two new videos for 4-H clubs on the topics of biosecurity and food safety when exhibiting and working at county fairs. Funding for these videos came from the Youth In Ag Grant from the Council for State and Territorial Epidemiologists (CSTE), the Centers for Disease Control (CDC) and UMASH. 6 Tips for Biosecurity – A Guide for Youth Livestock Exhibitors addresses the health and safety risks involved when bringing animals to a county fair or another venue where animals are present. This video describes six simple biosecurity practices to help keep you and your animals healthy. 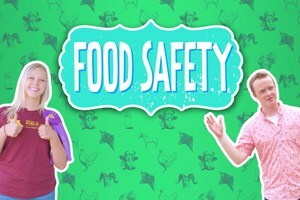 Keep Food Safe – 4-H Food Stand Worker Training is the second video in the series and highlights important food safety practices in order to prevent foodborne illness associated with 4-H food stands or other public food venues. UMASH collaborated with 4-H and MDH to offer resources in the development of these videos. Keeping safety and health at the forefront and implementing best practices is essential for all farms and youth involved in agriculture. Additional agritourism resources available on our website include: videos, a variety of educational posters, a Farm Fairs and Fun brochure, and an agritourism promotional toolkit. Visit the UMASH website at umash.umn.edu/agritourism to access these free resources. Joe Rand (Minnesota 4-H) and Carrie Klumb (Minnesota Department of Health) have utilized the Youth in Ag grant to produce educational materials with a focus on zoonotic disease prevention.